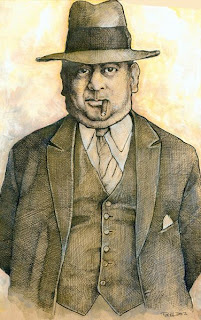 A quick notice for folks in New York City that this upcoming Monday, August 3rd, author Rose Keefe (The Starker: Big Jack Zelig, the Rosenthal - Becker Case, and the Advent Of The Jewish Gangster) will be on hand once again at The Lower East Side Tenement Museum for another appearance in their series of Tenement Talks. The evening is called Dead Guys in Suits: Gangsters in NYC and Rose will be accompanied by Gangster City author Pat Downey (whose blog shares the same name as the evening). Should prove to be a fun, engaging and eye opening affair. The Lower East Side Tenement Museum is located at 108 Orchard Street. The illustration above is an early piece I did a few years back of an amusing and mysterious character named Chowderhead Cohen.